When customers and other guests on corporate property slip and fall in incidents like these, the company or parties who own, possess, and/or manage the premises have a duty to guests – as well as other members of the public, such as business invitees – to exercise the highest degree of care and to keep the premises (especially the floors) in a reasonably safe and non-hazardous condition for anyone who stays there, visits, or conducts business on the premises. This is especially important if the owners or managers know or should have known about any hazards and/or failed to warn visitors of the hazard by putting up signs or closing the area off. Warn of the existence of the hazardous condition which they either knew, or should have known, existed, had they conducted proper maintenance and inspection of their hotel in the area where people enter and/or exit elevators; Where, because of these failures, the plaintiff suffers a number of injuries, causing them great physical pain and anguish, and an inability to go about their normal duties and activities, as well as economic loss. When corporate facilities fail to keep their property safe for the public, the results can be catastrophic, and not only result in injuries and medical bills, but permanent problems, loss, and difficulties for people for the rest of their lives. 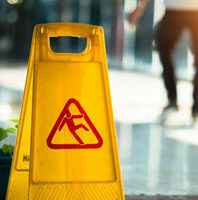 If you or a loved one was injured in a slip-and-fall accident, contact our Florida premises liability lawyers at Douglas & Carter today to find out how we can help you start on the path to recovery.